^ 2.0 2.1 2.2 2.3 2.4 Grey, Jennifer. 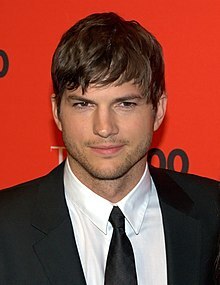 Ashton Kutcher: More than meets the eye?. The Washington Post. 2006-09-28 [2009-08-31]. （原始内容存档于2015-04-23）. ^ USA Weekend. Profile: Ashton's great balancing act. [2006-09-23]. ^ Hollywood.com. Profile: Ashton Kutcher Contemplate. [2007-10-06]. （原始内容存档于2005-04-14）. ^ 5.0 5.1 Meers, Erik (2001). "Dude – He's a star." Papermag.com. Retrieved October 6, 2006. ^ Cosmopolitan. Profile: Ashton Kutcher on past party days and his rock-solid relationship. [2007-10-11]. ^ Weitzman, Elizabeth. Kutcher in the Rye - brief article. Interview. March 2000 [2007-02-02]. ^ Mila's football lesson from Ashton. New York Post. September 25, 2012 [September 26, 2012]. ^ Mila Kunis and Ashton Kutcher's Superhero date. Virgin Media. September 26, 2012. ^ Mila Kunis and Ashton Kutcher are engaged: report. New York Daily News. [February 27, 2014]. ^ Rapkin, Mickey. Nobody's Fool. Elle Magazine. March 20, 2013.